I am in San Francisco, California, this weekend where the Esurance Tennis classic tournament has taken place for many years. This tournament helps raise funds for the Breast Cancer Foundation as well as the Northern Light School, a center that helps disadvantage youth play tennis. This event is organized by my good friend Rosie Casals . 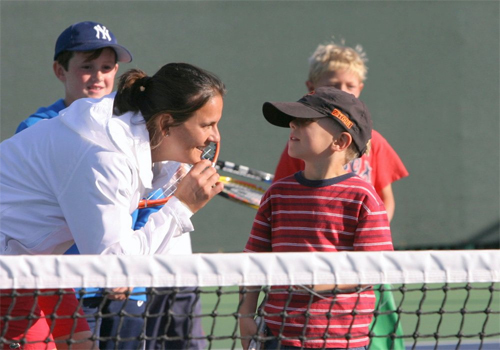 Rosie is a well known and successful tennis player who has won 14 Grand Slam tournaments 12 of those in doubles. This will be my fifth year participating in this worthy cause. Besides supporting the charities, I also love participating to catch up with old friends that I don’t get to see very often. Seeing them each year at this event is always such a joy! They have worked very hard to create an event not only for the players, but for the sponsors and children as well. We make it a priority that the kids and sponsors have a chance to play with the pros! This fun, tennis filled weekend usually follows the same schedule as seen below. Friday is the children’s clinic for those who have always aspired to become future great champions. A reception then takes place shortly after with the sponsors and organizers, where the players are presented. This year we have a special treat for everyone. The Bryan Brothers will be playing! Take this opportunity to publicize your band and hear them play! Saturday is a fun filled day full of tennis! There will be a morning tournament which will consist of a mixture between professionals and amateurs. The main event will then take place shortly after which will present some of the best tennis players from around the world. The fun doesn’t stop there! Saturday night is the charity gala dinner which supports two great causes, breast cancer and disadvantaged children. On Sunday, more competition will take place among the professionals. When that comes to an end, the official sponsor, Esurance will provide us with a great homemade dinner. This is always my favorite part of the event because people are always relaxed and ready to have a good time! So as you see, this weekend will be very exciting! Even though I always seem to end up very exhausted, it is all very worth it in the end. I always find great joy and satisfaction in helping a cause that I truly believe in.